Just two days before the 59th anniversary of Tunisia’s national independence from France in 1956, gunmen took over the Bardo Museum in Tunis, a major tourist destination. The resulting police response led to the deaths of 24 people, 20 of them foreign nationals from Poland, Germany, Spain, Italy and other states. News reports say that at least two groups, including the Islamic State known as ISIS, have claimed credit for the March 20 attack. This high-profile incident has been utilized in the West to escalate the so-called “war on terrorism” in North Africa. Although often cited by the Western media as the most stable state among those that had upheavals and regime changes in 2011, Tunisia has experienced political unrest and assassinations. Two leading left-wing politicians, Mohamed Brahmi and Chokri Belaid, members of the same Popular Front alliance, were killed by gunmen just months apart during 2013. After Brahmi’s assassination, the country erupted in mass demonstrations, led by youth and workers, demanding the resignation of the government. Although then-Prime Minister Ali Larayedh refused to resign, a post-uprising government dominated by the Ennahda Party did eventually dismiss the cabinet, setting the stage for new elections and the appointment of a so-called “technocratic” administration. The suspect in both killings of leftists was said to have been Boubacar Hakim, who was sought in connection with the illegal transport of weapons from Libya. ISIS forces are said to have training camps in Libya while engaging in several high-profile attacks in the capital of Tripoli, as well as in the eastern and southern regions of the country. Two men involved in the recent museum incident were killed when security forces stormed the building. One of the gunmen involved in the attack, Yassine Abidi, was reported to have been known to intelligence services, though they claim he had no formal links to a particular organization. Extremist organizations based in Libya are a direct outcome of the foreign policy of Washington, London, Paris, Ottawa and their allies, which coordinated the advances of these groups across Libya through massive aerial bombardments that lasted over eight months. Between Feb. 17 and Oct. 31, 2011, NATO planes flew some 26,000 sorties and dropped approximately 10,000 bombs on Libya. Tens of thousands were killed and millions more were displaced amid the destruction of the national infrastructure and the plundering of the country’s wealth. Yet the imperialists who carried out the destruction of Libya and empowered the extremist groups now wreaking havoc on the country are never cited for their culpability in current Western media reports, which ponder how stability can be restored to the oil-rich state on the Mediterranean. These armed rebel groups are spreading out from Libya into other states in North and West Africa. The European Union has reportedly been deliberating over whether it should establish another military force to supposedly secure the Libya-Tunisia border and challenge ISIS and other rebels operating in both countries. The EU plan would involve a stronger naval presence in the region, as well as the deployment of ground troops backed by air power. However, the EU announced on March 20 that it would continue to seek a political solution to the Libyan crisis and did not plan to send troops. But U.N.-brokered talks between the two competing rebel regimes in Libya have failed to bring about the creation of a government of national unity. Adherents to the former Jamahiriya political system under Col. Moammar Gaddafi are barred from participation in the current U.S.-imposed political arrangement in Libya. Neither of the two factions working with the imperialists — one based in Tripoli and the other in the eastern city of Tobruk — represents the aspirations of the workers and youth in the country or throughout Africa. Under Gaddafi, African unity to raise up the masses had been the focus of Libya’s foreign policy. A progressive national unity government cannot be imposed by the imperialist powers. It can only come about through the advancement of the revolutionary democratic forces in the country and the establishment of a political system that places the interests of the majority in Libyan society above those of the propertied classes allied with multinational oil interests and financiers. Such a system of national self-reliance and regional integration was the basis of the Jamahiriya, which was destroyed by the imperialist intervention. 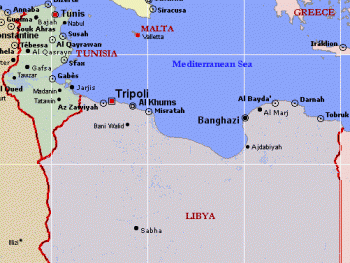 The EU, along with NATO and led by the U.S., created the current chaos in Libya. Sanctions, massive bombings and ground interventions leading to direct occupation by proxy forces have created the political crisis throughout the entire region of North Africa and the Middle East. Any real reversal of the situation must stress the necessity of genuine political independence and territorial sovereignty designed to break with the legacy of imperialism.